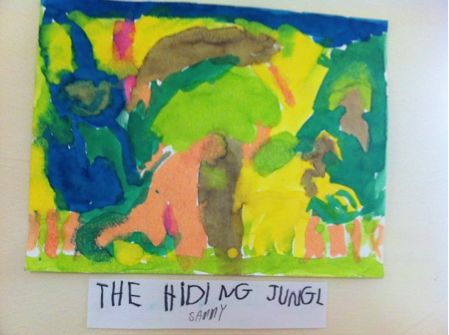 The next day, we set out blank white paper, markers, crayons, pencils, and pastels, and asked the children to “write” what they notice about the paintings. 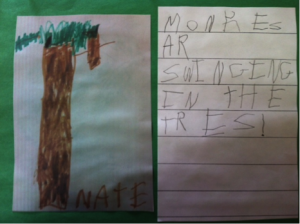 Every one of them first drew what stood out to them, and then wrote a sentence about it. 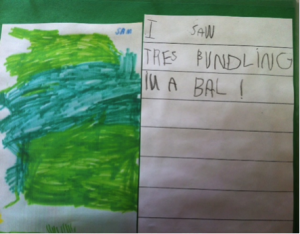 The students each took a turn to share what they had drawn and written. 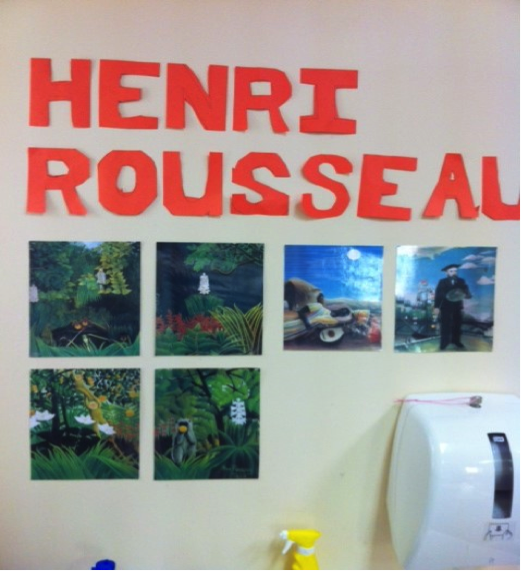 Along the way, we read parts of a biography about Rousseau, which included the interesting fact that he had never seen a jungle and painted largely from his imagination. 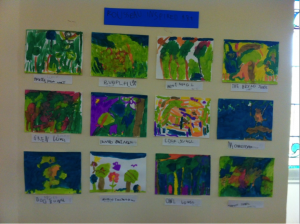 At the end of our artist study, we put out paints in the colors of Rousseau’s jungle paintings. The children were invited to use their imaginations, and paint whatever Rousseau had inspired. One of the children wanted to entitle his, and pretty soon they all had titles, from “Beautiful Flowers” to “Hiding Jungle”. Karen Ernst would be excited and proud of the work you are doing. 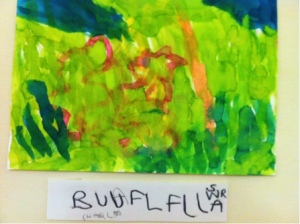 I teach a great artists program in my preschool class here in Tulsa. It is my favorite thing that we do! Thank you Lesley. .. I am very fortunate to be spending this week with some old KHS staffers at a visual literacy Institute at Yale. Glad you still have your hand in it in Tulsa! LOVE IT, HALLIE!!!! I LOVE that you are teaching art and letting your students interpret it in ways that make sense to them! Good for you,and good for your students! Thank you, Patty. … One day this fall, I’d love to have you come as a guest artist and share your work with my students.